Do *you* make silly faces and get all awkward in front of the camera? Do *you* pose and stick out your tongue when you take a selfie? Do *you* widen your grin and stiffen up? Do *you* run away when someone asks you to be in a photo? Think about it: how are you modeling what it means to have your photo taken? Kids feel the same way. They watch, they internalize, they react to what they see and the messages they get. 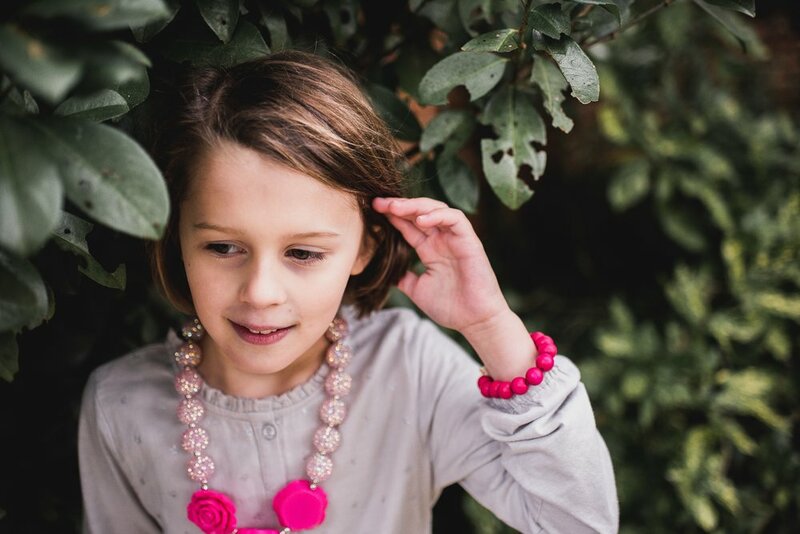 I’m willing to bet that you look at every photo of your kids with loving eyes, even if it’s blurry, but when you show up in front of the camera, you scrutinize every little detail. Sound familiar? It’s not wrong to want to look your best, and when setting up a photoshoot, it's tempting to just put it off because it’s hard to trust if someone else will be able to do that for us. But also consider that usually people who say they dislike how they look in photos have probably never had a photographer who paid them the right kind of attention. Someone who balances making you feel good and look good with angles and flattering lighting. Someone who encourages natural joy instead of stiff necks and still posing. That’s not usually a concern when you hand the stranger your phone at the zoo to snap a photo of your family day together. Take photos without asking anything of your kids except to keep being themselves. Then, (and this is this important part — really, don’t skip it.) show them the pictures later on, regularly, and talk about them. Talk about how you love seeing them (laugh, play pirate, swing from the monkey bars…) how you wanted to take a picture of _____ because it’s special to you or unique to your family. And sure, tell them they’re beautiful and handsome, but also talk about how they look happy, excited, angry, focussed… words that describe them as humans, beyond their appearance or performance. This builds a mentality that photos are not all about how you look. They are about actual memories. The next time you’re asked to be in a photo, practice what you preach! Accept that your children want to see photos of you, that they think you are beautiful and wonderful even if you don’t feel it in the moment, and that one day, you can both look back on those photos with a story to share. If you act and speak like you hate yourself in photos, your kids might start to, too. If you want more concrete guidance on how to use your camera to capture authentic moments at home, this course will be a great tool! Click below to learn more and jump on the list for more details. It's not for everyone, but is it for you?